Home International Is he a threat? Sure, Venezuela is a thorn on the side of the US, and has been for years. But a threat? To national security? 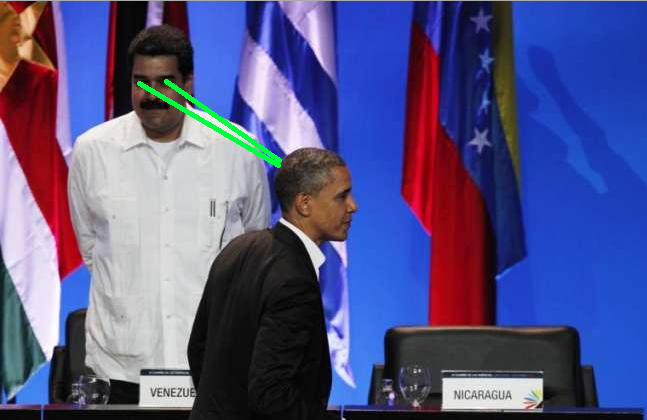 Well, Obama is right: Maduro is a threat to US national security. According to this definition, it is hard to make the case that Venezuela is a threat. There is no clear intention to inflict punishment or injury on the United States on behalf of Venezuela, at least not immediately. Up until now, Venezuela has not been taken as a serious threat by the United States government. In spite of all the bluster, fire, and brimstone coming from Caracas, the relations between the two countries had not taken dramatic turns for the worse in a while. Both countries maintained embassies – sans ambassadors – in their respective capitals, and the belief in Washington seemed to be that, as long as there was a modicum of democratic process in Venezuela, we would solve the problem on our own and they would simply wait out until chavismo withered. But several things have happened in recent months. Many opposition leaders are being imprisoned and/or tortured. Media has been muffled to a large extent. There is now a high probability that the few remaining formalities of the democratic process will be dispensed with. Venezuela is practically a narco-state. It has also decided that relations with the United States will be downgraded quickly, as the recent Embassy personnel flap reveals. And the government is quickly losing control of the economic situation, with hyper-inflation looming, severe shortages on the rise, and no policies on the horizon. In other words, Venezuela is a failed-state-in-waiting. Moreover, it’s a rabidly anti-American failed-state-in-waiting, led by people whose delirious phase seems way too intense to not take seriously. These were the folks who sent Bashar Al Assad diesel fuel in the middle if a war, who mourn the deaths of Saddam Hussein and Moammar Qadafi. These are the people who vote for North Korea at the UN, and think Russia has every right to reconstruct the Soviet Union. The United States has every right to be worried about chavismo doing away with democracy for good and becoming entrenched in power forever. Who knows what it would do five or ten years down the road? Everything from hosting Russian military bases to increased ties with Hezbollah or other radical Islamic groups could become a reality. Who would be able to stop them then? Certainly not the by-then-long-extinct Venezuelan opposition. Remember … an indication or warning of probable trouble. Even if your new neighbor kept to himself, you would still feel … threatened. Up until now, the United States has counted on the democratic process keeping chavismo at bay. But without democracy any more, can they afford to simply wait until Venezuela becomes an actual problem? Better nip this problem in the bud, seems to be the thinking. In that regard, the language in the Executive Order makes perfect sense. In sidestepping sanctions for ordinary Venezuelans while targeting the actual human rights abusers, the Obama administration is zeroing in on the problem without creating unnecessary controversies regarding “embargoes” or other nonsense. It has also chosen the perfect time for its offensive, right when the Maduro administration is at its weakest. It is most certainly creating tension and conflict within the ranks of chavismo. After all, it’s probably more difficult to target sanctions against someone like Diosdado Cabello, who has probably prepared for years for something like this, than it is to zero in on the guys in the second-tier of decision making, the ones actually implementing the orders from Miraflores. I doubt poor old Katherine Harrington-Colby has the testaferros that Diosdado has. Maduro and his cronies are a threat to US national security. Let’s hope the pressure makes Maduro bend a little and free some of the political prisoners. After all, how much worse can things get for them?